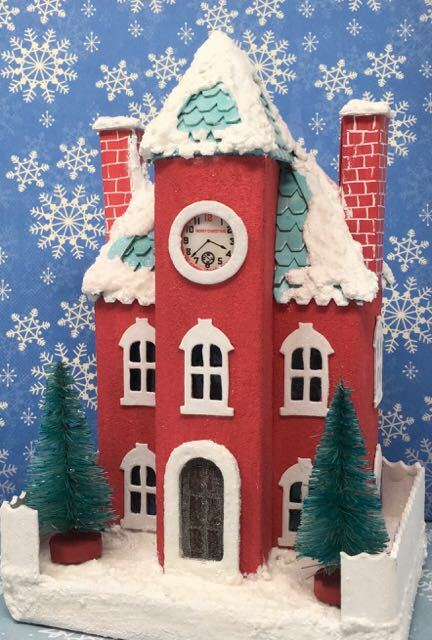 The pattern to make this Haunted Schoolhouse and Kelly’s Christmas Clockhouse is called the Front Tower Clockhouse. 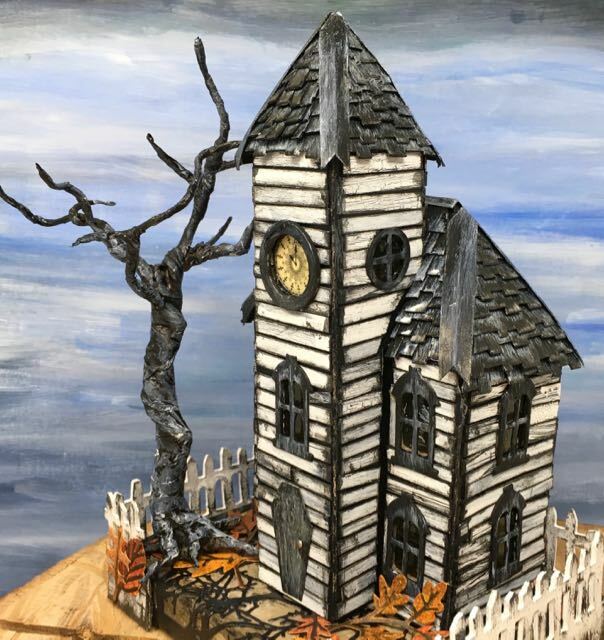 You can use it to make either a mildly spooky, haunted miniature house like the one below or a cheerful Christmasy house like Kelly’s house. 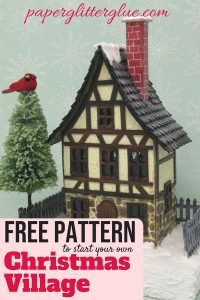 This FREE paper house pattern as the Front Tower Clockhouse is now available as a PDF to download from my library. 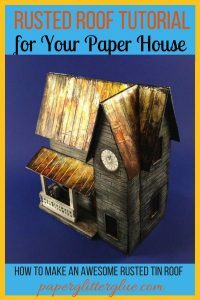 So let’s get started making this miniature paper house with a cool front tower and a hipped roof. When you take it one step at a time, it’s easier. Still honestly, I would say this is a moderately difficult paper house to construct. What is a Putz House and How Do You Make One? 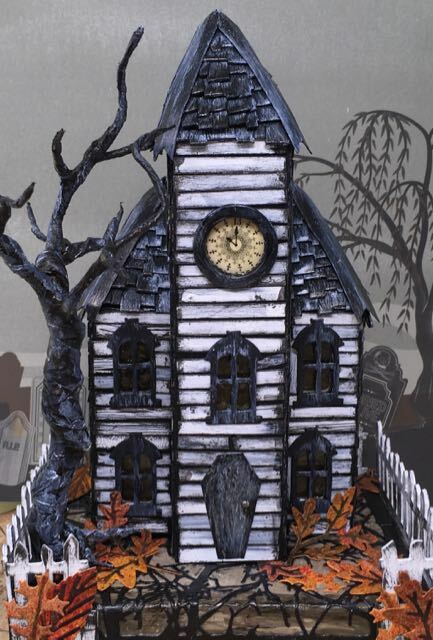 Download the pattern to make your Haunted Schoolhouse from my resource library. 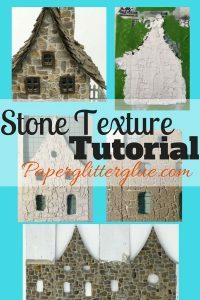 You can get the password for my resource library with the pattern for the Haunted Schoolhouse and other free patterns and tutorials by filling out the newsletter subscription form located at the bottom of this post. The pattern itself is not terribly complicated – it is a basic hipped roof house with a front tower. This pattern is a little larger than many of my patterns. So it requires a insert on the back to complete the house. In other words, it is larger than what fits on an 8.5 x 11 inch piece of cardboard. 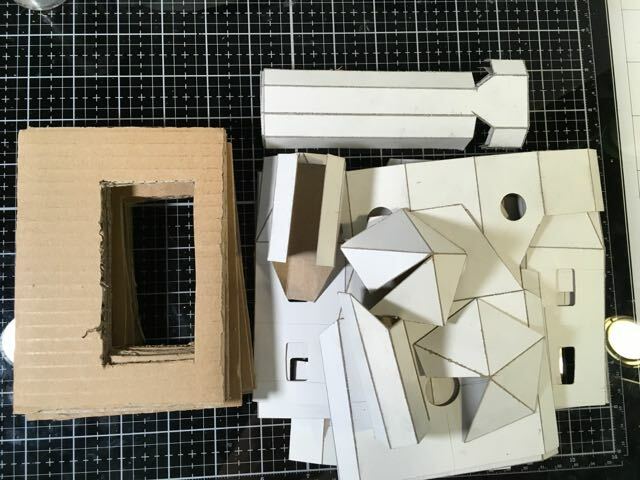 But you may shrink or enlarge your pattern to whatever size you want depending on your sources of paper and size of cardboard. Once you have the pattern copied, the score along the fold lines BEFORE you cut it out. It is so much easier to score before you cut because you have a bigger area to hold on to. I don’t always remember to do this, but I always mean to. I usually score the cardboard with the back of my craft knife to make the lines thinner and sharper. The house folds better when you do that. Often I do not draw windows lines on the patterns, but I think the window placement on this house is so important for the design, I have drawn them in. You can choose to simplify the design if you wish. Cutting out windows isn’t one of the fun steps. Since I make so many houses, I use an arbor press to help me cut out the windows. Here’s a post that explains how that arbor press works for cutting out windows. You can buy these dies very inexpensively and use a hammer rather than an arbor press to cut out the windows. Depending on the colors of the house I prime the house with either white or black gesso. 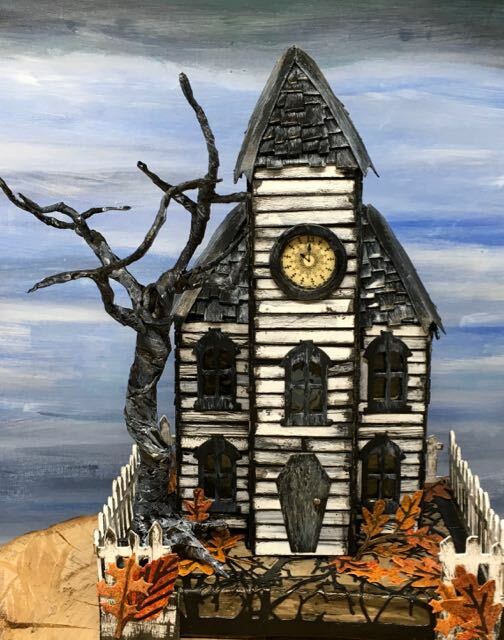 Since this is a Haunted Schoolhouse designed for Halloween, I primed this house with black gesso. Also when I glue on individual strips of crackle siding, I want the space between the strips to be shadowed black. When I am adding a detail like this siding, I find it easier to apply before the house is assembled. You can do it later, but it’s a little easier at this stage. 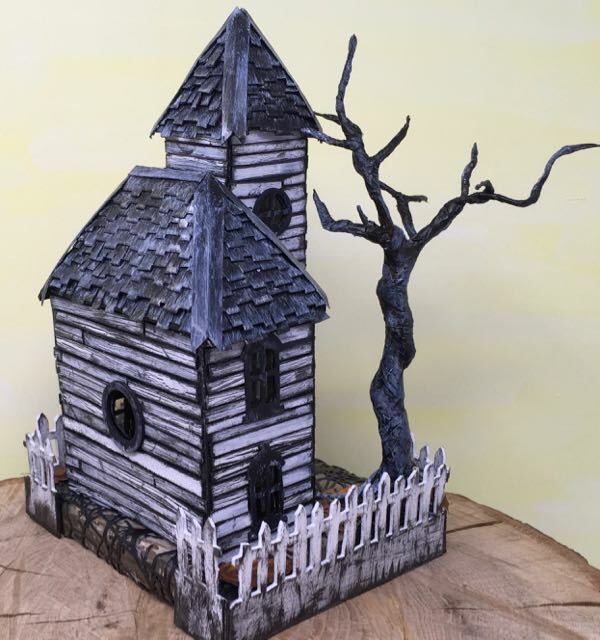 Often I use the Tim Holtz Sizzix Village Rooftops for the roof shingles. That’s what I used one for this particular house. Truthfully, it takes awhile to cut the angles and glue on all the shingles. But I like this kind of detail work. You may not. If you don’t like it, just paint the roof. 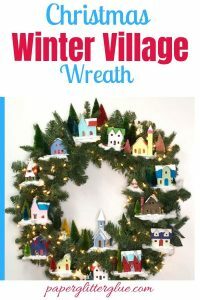 If you are making a Christmas house with this pattern, cover up any seams with snow. Or even on a seasonal house you could add leaves scattered about the roof. It’s just easier this way. Almost forgot this step. 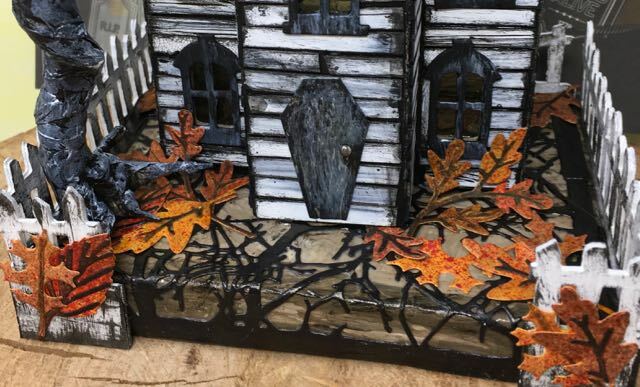 To make window panes for the little houses, I use plastic packaging stained with alcohol ink, then coated with Ranger’s Glossy Accents to make them translucent and kind of spooky – like wavy glass. I glue them on with Glossy Accents as well. For this one I wanted the house to have windows to look like smoky glass similar to mica. So I stained them with mushroom alcohol ink. 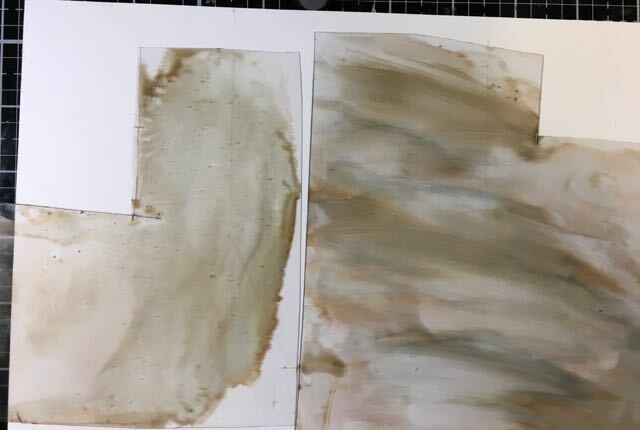 Plastic packaging stained with Mushroom colored Ranger alcohol ink for paper house window panes. It is supposed to look blurry – that’s the purpose. Now glue to the inside of the house after you have painted or applied the siding, but before you glue the house together. You can do it afterwards if you forget (as I sometimes do), but it is easier at this step. Also I cut out a door in the shape of the coffin to enhance the spooky Halloween, haunted feel. 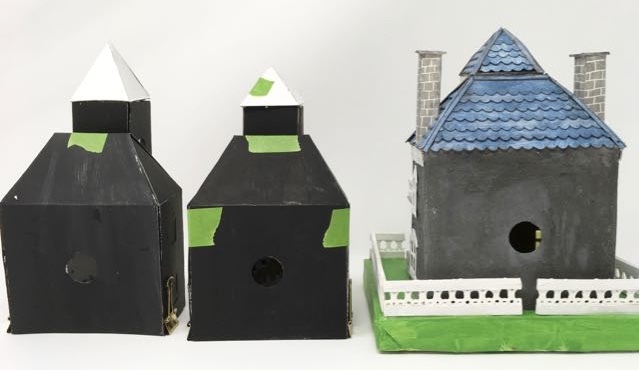 This pattern includes 2 different types of chimneys. 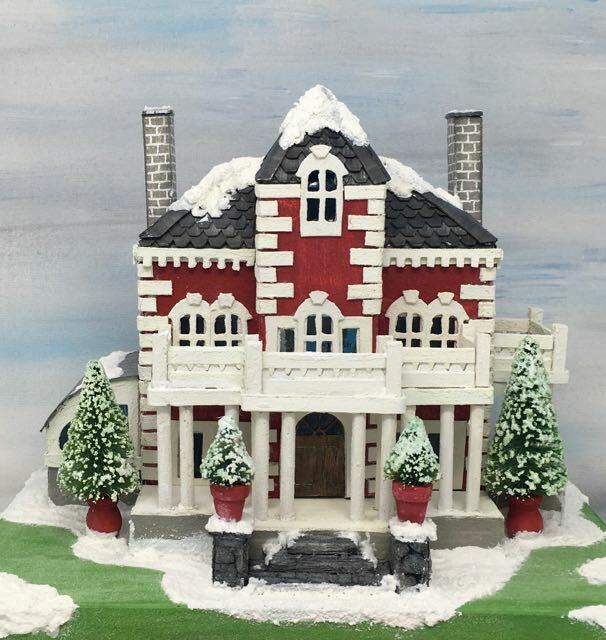 One pattern can be used on the side roof like you see on the Spring Mansion and Kelly’s Christmas Clockhouse. The challenge is trying to make the chimneys stand up straight. I rarely succeed in that. Mine are generally a little crooked. However, the Wilkins house twin chimneys look pretty good. Twin chimneys on the Spring Mansion. Ignore the wonky siding on the porch and the fence, please. 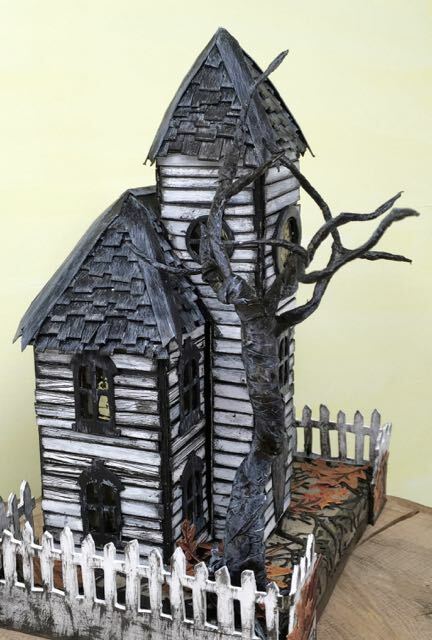 Now the Gothic Halloween house has an elongated side chimney. 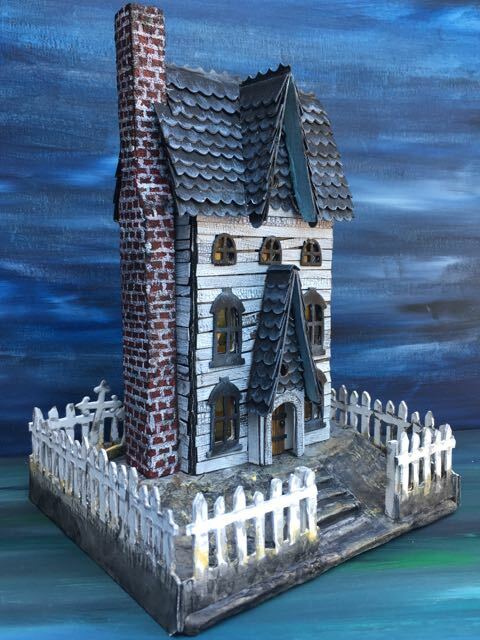 This Haunted Schoolhouse Putz House pattern would look really cool with twin side chimneys. If you use side chimneys you do not cut windows on that side. Now I have a confession. I forgot to plan for chimneys and ended up not adding a chimney to this house. With luck, I will remember in time for the next house – Ebonywood. Here’s how the hipped roof looks like inside. Glue these roof flaps down as well. Glue the roof flaps to the inside of the house. It makes a very sturdy structure. Glue the front tower addition on straight. It’s a bit of challenge, for me at least. Make sure the tower is square – meaning that the sides of the cardboard tower piece are not squashed inward or splayed outward. 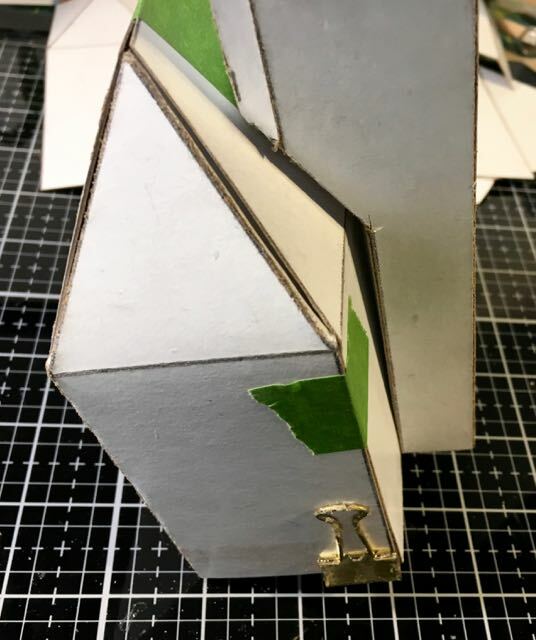 While gluing, hold the tower tight to the house so there isn’t a gap between the tower and the roofline and body of the house. You can either do that with tape or the old standby – your own fingers. Fingers work better. The photo below shows how the tower piece fits to the roof and the front of the house. I hold it in place when I glue it to the house. Test fit the front tower to make sure that the angle of the tower fits the roofline before you glue it down. Remember to glue the chimney in place before you start adding the shingles. I forgot on this house that’s why it doesn’t have a chimney. 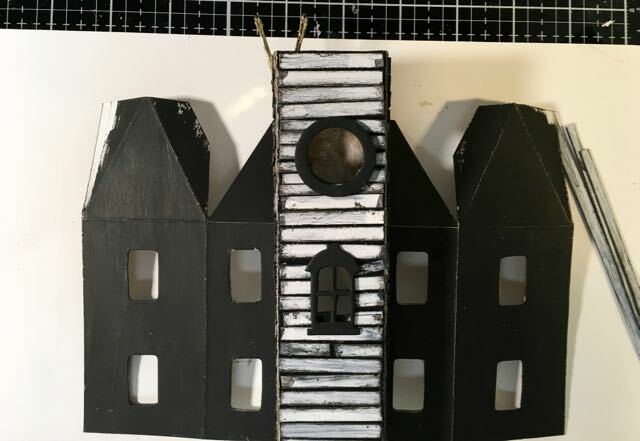 The next one (tentatively named Ebonywood) will have twin chimneys on the roof. 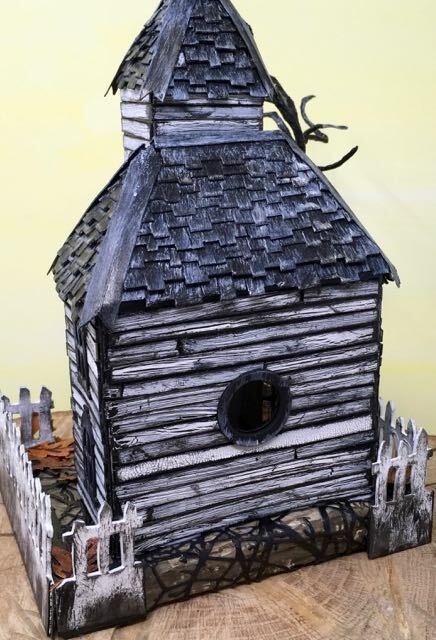 Here’s how I make a base so I can add LED tea lights to light up the little Putz house. 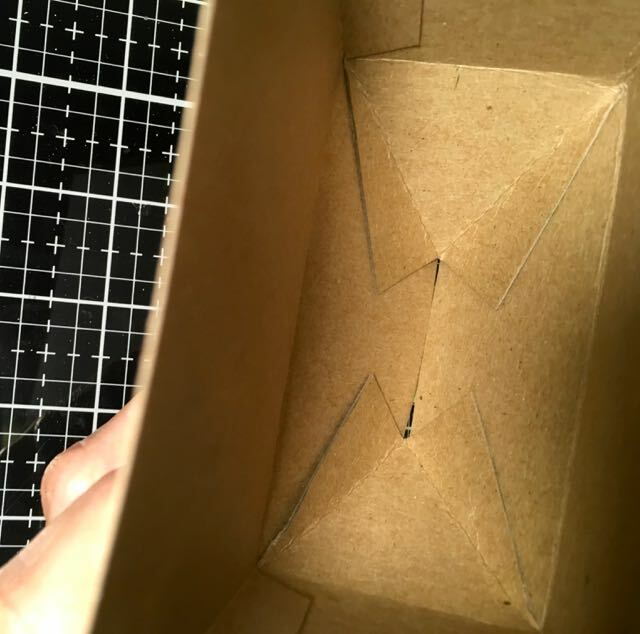 There’s more detail on the construction of the cardboard base in this tutorial. 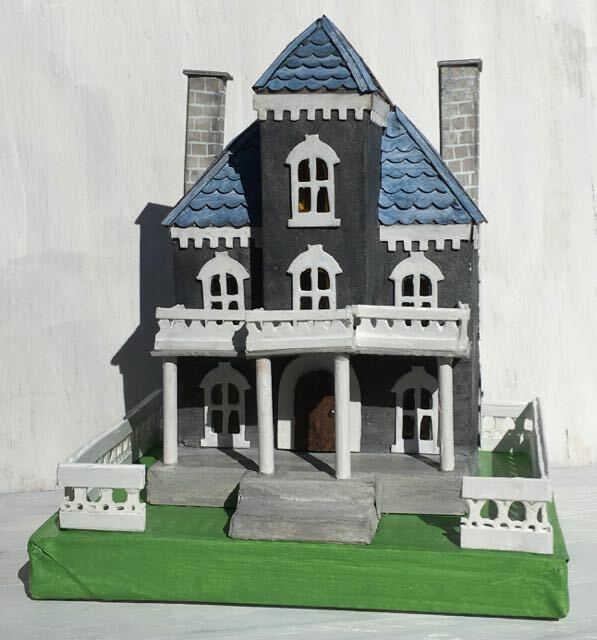 Using 4 layers of corrugated cardboard, cut out a section large enough for 2 LED tea lights where you would like the house to be located on your base. The little battery operated LED lights that I use are 1.5 inches in diameter so I cut a space just a little larger than that so they will fit. The house width is 2 inches so keep the cut out section about 1.75 inches wide. Cover the base with paper. You can wrap it like a gift or cover it with torn strips of paper mâché. That’s what I like to do with my Halloween houses. I just like the rough, wrinkled surface paper mache provides. Paint the color of your choice. Finally, run a thick bead of glue around the edge of the house and adhere to the house to the base. Now you get to add embellishments. I chose to cover the base with a Sizzix die cut called Tangled Twigs. Then I added some leaves from a Tim Holtz Sizzix die cut called Funky Florals. These leaves have a lot of personality. The fencing is a retired Sizzix die called “On the Fence”. You can still find it online though. And then I had to add a spooky Twisted Tree just for a little extra haunted detail. It’s not glued down yet. I wasn’t sure at first that I wanted it there, but now I know I do. So that’s the Haunted Schoolhouse. Oh, one thing is that I entered it in the Simon Says Stamp challenge called “Monochrome”. I hope this project is monochromatic enough. Check out their page it is full of incredible inspiration. Thank you for stopping by my blog. Let me know if you have any questions.